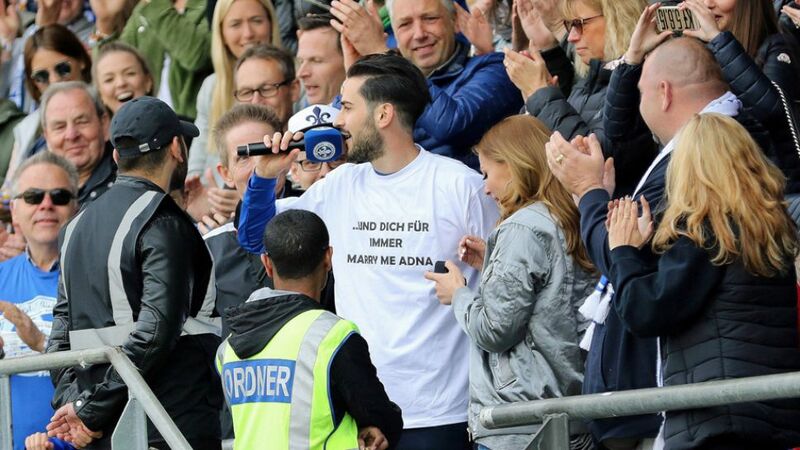 SV Darmstadt 98 midfielder Mario Vrancic sprung a surprise on Matchday 34 by proposing to his girlfriend. Although the Lilies lost their final outing of a memorable season 2-0 to Borussia Mönchengladbach, the Vrancic lovebirds gave fans inside the intimate Merck-Stadion am Böllenfalltor a classic Hollywood ending. "She said 'Yes'!" Vrancic shrieked, after getting down on bended knee, microphone in hand, at the feet of his future wife-to-be, Adna. "She was really embarrassed, so it all went to plan," he later revealed, skating over the pre-proposal butterflies he experienced earlier that afternoon. "I've never seen Mario so nervous," Darmstadt captain Aytac Sulu recalled. "He was as white as a sheet when he told us about it on the pitch. Fair play to him for having the guts to do it. We're all delighted for the two of them." Vrancic's grand gesture caps a joyous campaign for all concerned with the promoted club, who secured their safety a week earlier thanks to a 2-1 win away to Hertha Berlin. Mario Vrancic takes his girlfriend by the hand. And she says 'Yes'! Congratulations, Mario!